This Set Fits all Toddler Beds and Cribs (Single or Convertible) (USA, UK, AU, Etc..) The Set includes following 10 pieces: * Crib Quilt * Crib Bumper * Fitted Sheet * Crib Skirt (Dust Ruffle) * 2 pieces of Window Valances * Diaper Stacker * Toy Bag * Baby Pillow * Baby Bib or Baby Mittens Plus:Diaper Bag with Accessories. Slight variation may occurs without prior notice. This Set Fits all Toddler Beds and Cribs (Single or Convertible) (USA, UK, AU, Etc..) The set includes the following 14 pieces: * Hand Embroidery Crib Quilt * * Fitted Sheet * Crib Skirt (Dust Ruffle) * 2 pieces of Window Valances * Diaper Stacker * Toy Bag * Baby Pillow *Baby Bib* we also included the 4 pcs Diaper Bag set which include: The Diaper bag, Changing Pad, Bottle Case and Accessory case. 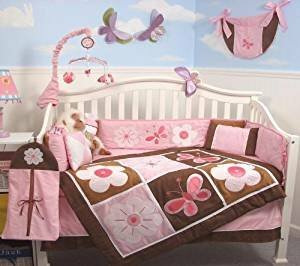 SoHo Designs pink and brown sweetie garden bedding set which the comforter & bumper both can reservisable into the Pink and Sage Argyle print , this 10 pcs baby bedding ensemble has all that your little one will need. This modern baby bedding set uses exclusive SoHo Designer coordinating 100% cotton prints. It fits all cribs and toddler beds. The 10 pcs. 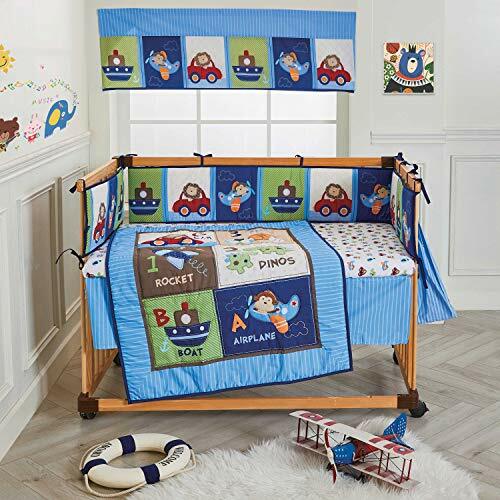 included in this set are: comforter, crib bumper, crib skirt (Dust Ruffle), fitted sheet, toy bag, baby pillow, diaper stacker, 2 window valances and Baby Bib or Baby Mittens. We also included the Diaper Bag with Accessories. SoHo Designs produces only high quality items, and of course every piece is non allergenic. Brand New in Zippered Handled Carrying Bag. 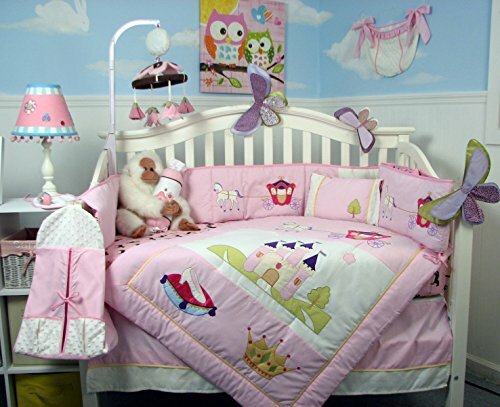 This Set Fits all Toddler Beds and Cribs (Single or Convertible) (USA, UK, AU, Etc..) ! 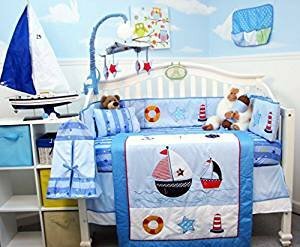 Total of 10 Pieces as Follow: * Hand Embroidery Crib Quilt * Hand Embroidery Crib Bumper * Fitted Sheet * Crib Skirt (Dust Ruffle) * 2 pieces of Window Valances * Diaper Stacker * Toy Bag * Baby Pillow * Baby Hat or Baby Bib We also included the Diaper Bag with with Accessories. 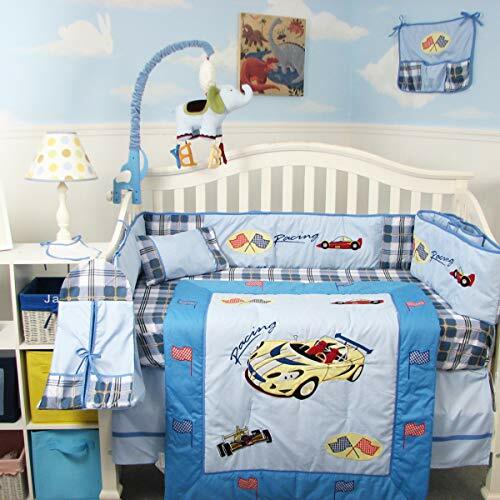 Blue nursery bedding will give the house a sense of humanity & artistry.The style is decorated with popular cars, airplanes and rockets and even a cute dinosaur on it. Choose our Wowelife can refresh your baby bedroom with a happy environment and help baby have a good sleep and colorful room decor.Package Includes:1 comforter: 33*42 inch(84X 107CM)1 fitted sheet: 50*27.5+8 inch (130X 70+ 20CM)1 bed skirt: 50*27.5+9.8 inch(130X 70+ 25CM)1 diaper stacker: 22.5*12*7.2 inch(57.2X 30X 18.5CM)1 window valance: 90*14.7 inch(228.6X 37.5CM)4 bumper pads of 2 X long pads: 52*10 inch(132X 25.4CM); 2 X short pads: 28*10 inch(71X 25.4CM)Material:100% cotton fitted sheet, soft to touch, breathable and hypoallergenicIdeal for baby soft skin,comfortable sleepA great gift idea for house warming, birthday and baby showerWashing Instructions:Wash Method: Machine Washable & Hand WashSUGGESTIONS:Use neutral detergentDon't use bleaching detergentWash in cold waterNotice:1. Due to Different standard of the bedding set between different countries,please check the size before you place an order.2.Before you left the review or feedback ,any problem ,please come to us ,and we will surely help you out. 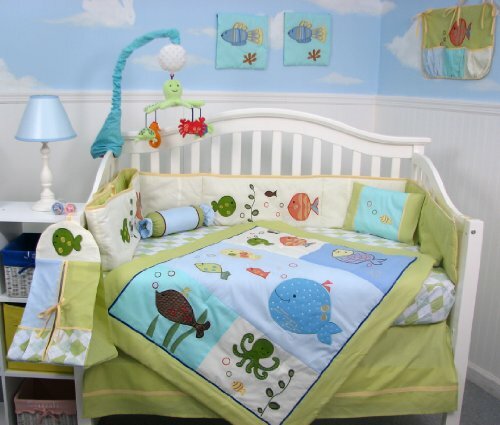 This Baby Crib Bedding Set comes with these 10 pieces: Comforter, Dust Ruffle, Fitted Crib Sheet, Bumper Padding, Baby Bib, Toy Bag, 2 Valances, Diaper Stacker and Baby Pillow! We also included the Diaper Bag with Accessories. Highest Quality. Sure to be an instant hit! Features embroidery, hand-stitching details, appliques, fine cottons and more. 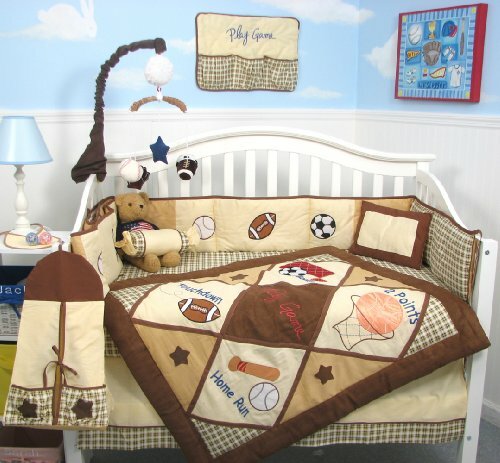 Sports Nursery Theme 100% Cotton, Price offered is a Limited Time Offer. Fits all Toddler Beds and Cribs (Single or Convertible) (USA, UK, AU, Etc..) ! Dream big little one with - The Dreamer Collection by NoJo - 8-Piece Piece Crib Bedding Set - Elephant Blue & Grey! This elephant inspired playful set includes an adorable, double-sided comforter featuring blue, grey and white mini dot elephant silhouettes on a blue background trimmed with grey border, the backside features a circle mini print in grey and white. The first crib sheet is featured in a grey & white circle pattern, the second crib sheet is a blue, grey and white elephant pattern. The dust ruffle is solid grey with a border in blue and grey elephants marching across the bottom edge; the adorable decorative pillow comes in blue with grey & white dot elephants; a solid blue changing pad cover; a coordinating diaper stacker with circle printed top, blue elephant pattern below; and a super-soft coral fleece blanket in solid blue. Look for the whole line of NoJo -The Dreamer Collections matching accessories and nursery decor. NoJo - Only the Best for Baby! Shopping Results for "Diaper Crib Set"